Wildhorn Outfitters Seaview 180 Degree V2 Review - Is it really that good? 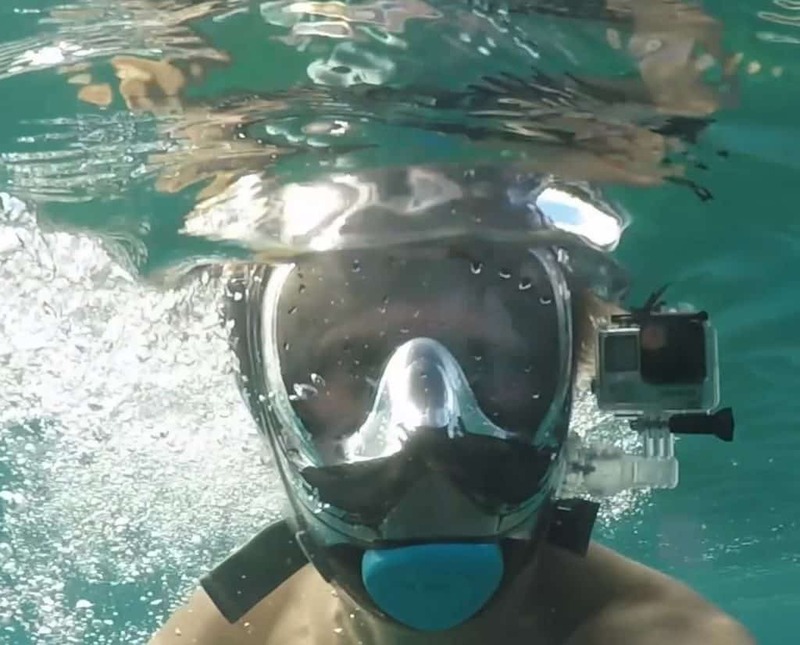 By now we’re all used to seeing full face snorkel masks when we are anywhere where snorkeling is possible. Yet, this mask pushes the envelope just by looking at it. 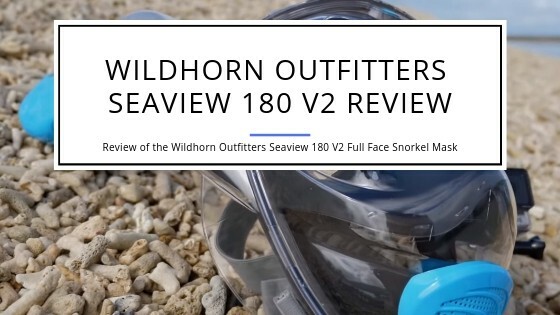 We’re excited to review the Wildhorn Outfitters Seaview 180 Degree V2 for you! You’ve probably seen the typical full-face masks with the snorkel coming out on top of the mask. These types of masks provide you with a panoramic view and you can breathe through your mouth and nose. 1 What’s new with V2 of the Seaview 180? 9 Keeping it clean and alive for long! 10 Can you use it for freediving? 11 Is it really that good? 12.1 What is the best full-face snorkel mask? 12.2 What makes full-face snorkeling masks so popular? 12.3 Are these great for children? 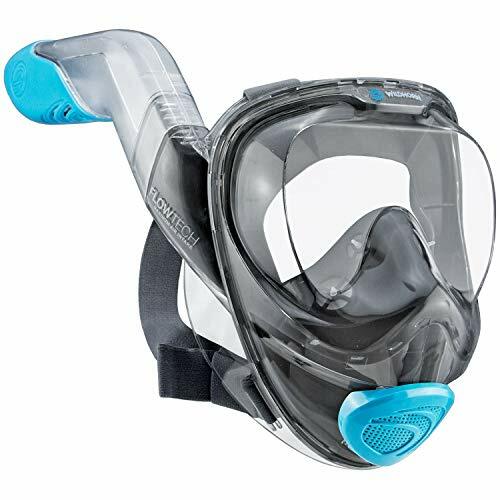 The best ones of these masks are (were) the Wildhorn Outfitters Seaview 180 and the Tribord Easybreath. Until now. There’s a new kid in town and the cards are being shuffled again. Wildhorn Outfitters introduced the version 2 of their wildly successful and highly praised Seaview 180 in early 2019. And when they say V2, they really mean it. It’s not just a few updates here and there, it’s a revolutionary design change. It’s also interesting to see that Wildhorn took a completely different approach to funding the development and tools required for the mask. They started a campaign on Kickstarter to fund the tooling and hoped for $20,000. They ended up with more than $400,000 in pledged funding! That alone shows how many people find this revolutionary approach to a full-face mask tempting and worthwhile! You can check out the Kickstarter page for more information! What’s new with V2 of the Seaview 180? A whole lot has changed when the Seaview 180 V2 hit the market. It truly is a revolution in design and a major step in making these types of snorkel goggles safer and even more convenient and comfortable than what they already were. We focus on highlighting the design choices made by Wildhorn Outfitters for this mask together with outlining the benefits you get when using this mask. Just a first glance shows you that this mask takes a completely new approach to the full-face covering snorkel goggles you’ve seen in the past. The snorkel is integrated on the side and not the top, resembling the position where the snorkel is located with traditional snorkel goggles. Looking at it from a design, it makes a lot of sense. The air you breathe in and out can be funneled easier into the snorkel and doesn’t flow through the rest of the mask. The advantages are that you’re breathing even easier and more natural in the V2 compared to other masks of this kind. Not having to deal with the exhausted air that is humid in your field of view also improves the fog resistance (or free-ness if you want) compared to traditional models. Lastly, the better transport of air in and out of your mouth and nose reduces the elevation of CO2 in the air you breathe in. While all high-quality full-face snorkeling masks are designed to specifically remove the CO2 quickly and satisfactorily out of the mask, some cheaper models might not have that much thought put into them! The snorkel is also shaped differently on top. This optimizes the position of the air intake above the water. As you’d expect, it’s a top-dry snorkel design that prevents water from getting into the mask and breathing chamber. Having the position of the air intake optimized does improve the overall snorkeling experience a lot. Your position in the water is better and you get more relaxed. Snorkels on top of the mask do at times lead the snorkeler to keep the head held up instead of straight in the water. The Seaview 180 V2 does in our opinion a better job to encourage to hold the head steady in the water. While the snorkel is longer which usually requires more effort to breathe in and out, Wildhorn Outfitters in this case also made it larger. 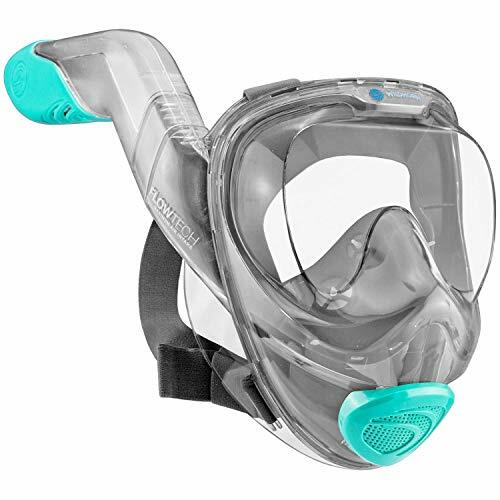 This in combination with the unique design provide a better airflow than the typical full-face mask. The breathing and snorkel design is called ‘Flowtech’. It does deliver on the promise to make breathing easier and position the air intake at a better angle and position. The fun at snorkeling stops when you’re wearing a leaky mask. Water inside the mask is annoying and makes the experience a hassle. The original Seaview 180 was great at keeping the inside dry. If you got the right size mask you most always did not get water into the mask. The snorkel had a mechanism to keep water out and the mask itself has a silicone skirt that produces a tight seal with your skin. The V2 takes it a step further. We already mentioned that the snorkel position is optimized which, in combination with the dry valve, prevents more water in a wider range of positions and situations to enter your mask that way. Yet, as with all dry snorkels, you can overcome the capabilities offered. If you dive straight down then the valve can’t close and water can enter through the snorkel into the mask. This is an issue that all dry snorkels have and nothing that’s specific to the Seaview 180 v2. If you want to dive underwater with this mask then do it at a slight angle and you will be fine. The snorkel valve can close and it will keep you dry. The skirt is thick and soft and made from hypoallergenic silicone. It seals tight against your skin and allows no water to get in. Should, under some unforeseen circumstance, water get into the mask then it’s easy to get it out. There is a purge valve at the base of the mask. Simply lift your head out of the water and the valve opens and the water drains out. No need to panic as it’s a quick and easy way to get any water to flow out. The Wildhorn Outfitters Seaview 180 Degree V2 has one of the widest fields of view you can get. You get a full 180 degree view through the flat lens. Some of the first snorkel masks that provided a wide view used rounded masks. This does provide a somewhat more focused view out of the edges but also produces a slight distortion when you look straight out. A flat lens provides a clearer view looking straight but a slightly distorted view around the edges of your field of view. Most times you look straight out and therefore having the better view in this direction provides a lot more benefit compared to less distortion around the edges. 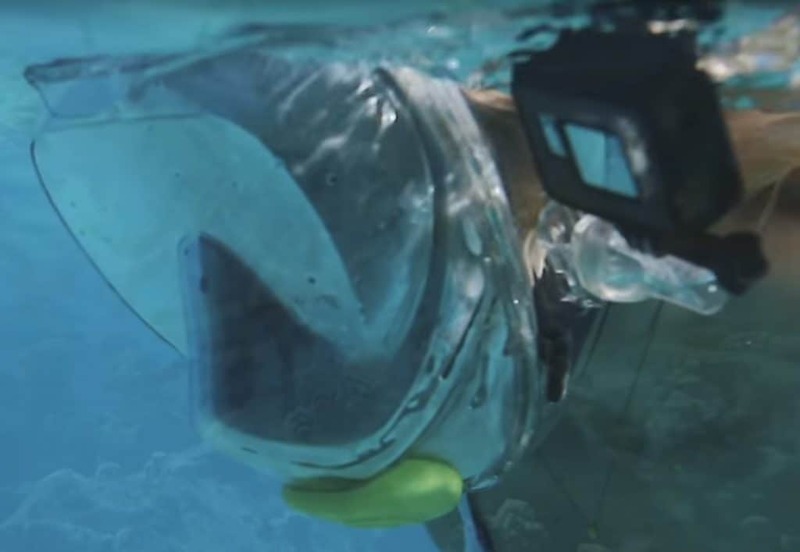 Another advantage of the V2 is that it has a separate breathing chamber that directly connects to the snorkel. This reduces the accumulation of humid air inside the mask as it never really gets into the mask itself. This by itself reduces the chances of fog building up on the lens. A specifically designed air flow system inside the mask does the rest and keeps the lens fog-free in pretty much any condition. In our opinion none of the other available masks at this time even stands a chance to beat the Seaview 180 V2. The airflow is superb and keeps your visibility at a maximum. Nearly all other full-face masks that have an Action camera mount have it on the top of the mask. At first you might think that this is the best position you could have. It’s in the same direction as your mask and it’s not anywhere in your view. However, there’s one problem with that position. If you’re not keeping your head flat in the water but lift it up a little, then your camera comes out of the water and films what happens above the water instead of what’s going on underwater. The 2nd version of the Seaview 180 takes care of that issue with the mount of the action camera being on the side of the mask. This keeps it out of your field of vision while it also ensures that the camera is underwater all the time. Your movies will be a million times better and you can show your friends and family what you’ve seen underwater instead of showing them what happened above! In the early days many manufacturers provided a large number of different sizes. This made it somewhat confusing to figure out what the best matching size for your head would be. It’s simple to find out what the best size for you is. You measure from the bridge of your nose down to your chin. Either ask somebody to measure it for you or do it in front of a mirror. Buy the mask in the size that matches your measurement and you’ll get the perfect fit for your face. If you get a mask that’s too small or too large then you most likely will end up with a leaking mask that isn’t comfortable to wear! Having a variety of colors to choose from is not of any help when it comes to safety. However, it can be fun to pick a bright color and match it with your preferred outfit like a rash guard instead of going with a bland black or grey. One would think that at some point in time more colors will come. Pink or a bright yellow might be nice options for different people! Keeping it clean and alive for long! Keeping the mask clean is pretty easy. You’re dealing with plastics and soft silicone so you definitely do not want to use any harsh chemicals! Most times it’ll be enough to rinse the mask with clean water. It’s important that you really wash out all the areas of the mask to prevent any small particles to stay behind. Do that anytime after you use the goggles and they will stay clean for life. It’s very important that you keep the mask in a place where you have good ventilation. This allows it to dry completely and prevents any moisture from building. To store the mask you simply make sure to keep it in a dry, ventilated and dark place. Constant exposure to sunlight can and will damage the silicone and plastics of the mask. When you’re at the beach then put a towel over the mask instead of baking it in direct sunlight. Lastly, always keep the lens off of sand. The fine sand particles can scratch the lens and eventually it’ll start to impact your visibility. Can you use it for freediving? The Seaview 180 V2 is designed specifically for snorkeling. It’s not a good fit at all for freediving. First, it has a large volume for a freediving mask. A lot of air is trapped in the mask which makes it much harder to dive down. Second, the materials are top-notch but not the right ones for the pressure you experience when you dive deep. You want to use tempered glass lenses for diving down. Wildhorn Outfitters used highest-quality polycarbonate for the mask but it’s not as safe and sturdy as tempered glass. To say it in one word: Yes. We think that at this time this is the best full-face snorkel mask you can get. Other competitors including the original Seaview 180 are great and you won’t have any complaints if you buy a high-quality model. However, the design choices made with the version 2 of the Seaview mask are simply superb compared to older models. This mask is not simply an evolution but a revolution. Wildhorn Outfitters took all they learned from the original design and made it better. And just to understand how good the first version was and is. There are thousands of five star reviews that you can find online. The old version is most likely the best-rated full face mask you can find. We are certain that the new version V2 will take that top spot within a short period of time. It’s that good! Just make sure to measure your size correctly and then enjoy your snorkeling in a whole new way! What is the best full-face snorkel mask? Until a not too long ago it was a tie between the Tribord Easybreath (checkout the review here) and the Seaview 180 (old version, review here). With the introduction of the V2 of the Seaview 180 we do believe that we found a new ruler. What makes full-face snorkeling masks so popular? For decades, if you wanted to snorkel, you got a cheap scuba mask and a snorkel. You could only breathe through your mouth and had to clamp your teeth down on a piece of plastic to keep the snorkel in. Any tiny wave caused water to get into the snorkel and into your mouth. Your vision was restricted to look straight out of the mask. If you are somewhat claustrophobic, then you were on the edge of a panic attack as soon as you put the googles on. Sounds like a joyful experience? Are these great for children? These kinds of masks are actually the best choice you can make for kids. They are comfortable and easy to put on and off. Breathing is natural so your kids don’t have to learn to suppress the urge to breathe with their nose as they’d do with traditional masks.